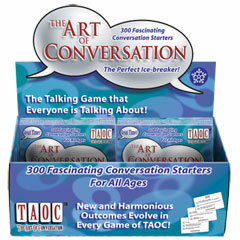 Designed to revive the art of conversation®, TAOC® is a fabulous way to make all get-togethers of Families and friends memorable. TAOC® can even help revive relationships! And get the whole family talking again! With 300 fascinating, conversation building questions, plus 4 blank cards on which to write your own TAOC® questions, this game is for everyone. to TAOC® is your own life experiences, interests and ideas. 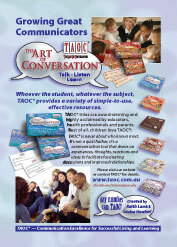 TAOC® is also a wonderful therapeutic, educational and corporate resource.